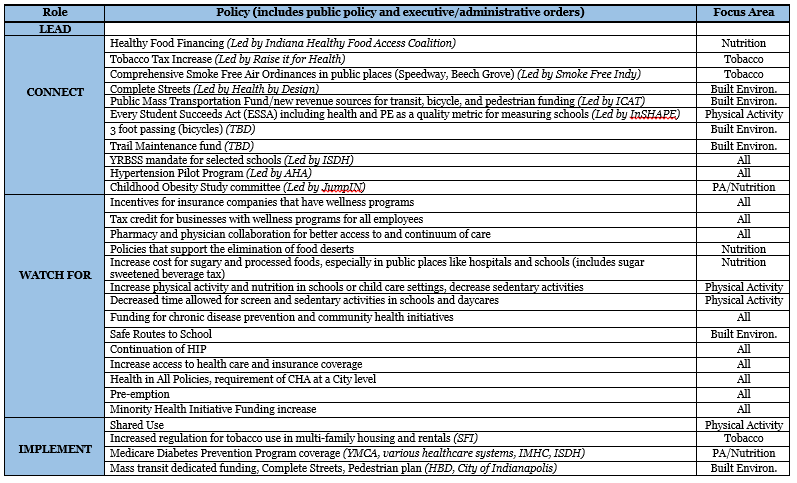 Policies currently listed under “participate” include those that have not yet been officially proposed by another partner, but have been identified as an area of interest to Top 10. (Note: Participation does not require steering committee approval, only policy taskforce approval if the policy is aligned with at least 1 of the 4 Top 10 focus areas). In Quarters 2 and 3 of each year, Top 10 will survey all existing partners to determine any new or emerging policy priorities they are pursuing. If the policy is something Top 10 will support. If the taskforce determines the policy is something Top 10 will support, they will also determine which role is appropriate for Top 10 (Lead, Connect, or Participate). The steering committee will give final approval. If new policies emerge in the middle of the year, requiring immediate action from Top 10, they will be sent to both the steering committee and policy taskforce for approval.